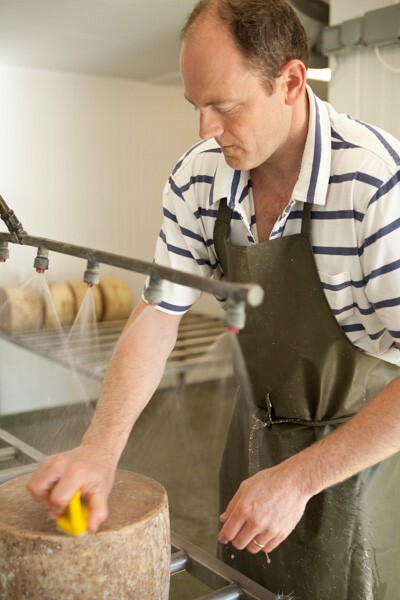 Simon Jones, who started to make Lincolnshire Poacher cheese, is the fourth generation to be running the farm, which has been in the family since 1917. It is situated on the edge of the beautiful Lincolnshire Wolds about ten miles from the east coast. The lush pastures sit on chalky land, which enables him to have a successful dairy herd in an area where dairy farms are very scarce and cheese making is virtually unknown. 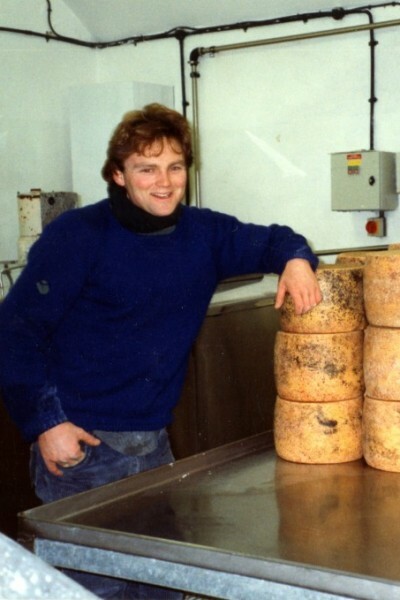 The farm began dairying in 1970 with Simon’s father, Richard, but it wasn’t until Simon came back from agricultural college and needed something to get involved with, that he looked into the possibility of making cheese on a small scale. His research began with a cheese making course at Reaseheath college and visiting various cheese dairies in the South West. 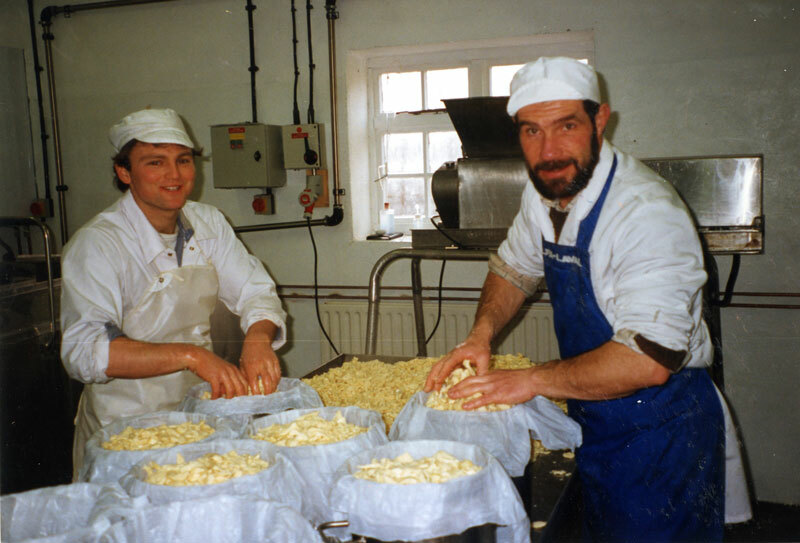 He then set up a small dairy of his own with a 1000 litre vat and with the help of Welsh cheese maker Dougal Campbell, who came armed with a tonic bottle of rennet and a sachet of starter, made his first batch of cheese on February 17th 1992. The recipe was based on Dougal’s own cheese called Tyn Gryg. Dougal’s parting comments were “Right boy, you can make the cheese tomorrow”. So Simon started making cheese on a regular basis from then on. The cheese proved very popular, to such an extent that in the local cheese shop customers were rationed to ¼ of a pound each! 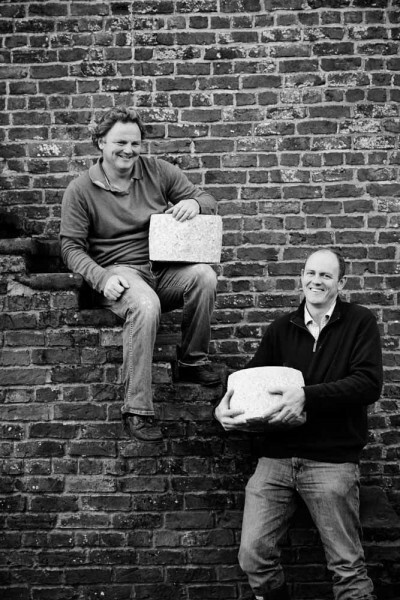 This early success led to Simon taking on a full-time cheese maker, Richard Tagg, and in 1995 the creation of a larger cheese dairy, within a lovely old farm building. Now the vast majority of the farm’s milk is turned into cheese, as a rule seven days a week. The cheese is still being made, by Richard, in this dairy today. Cheese sales have grown dramatically since production began. All of the milk produced on the farm, with the exception of a small quantity bottled and sold at Farmers Markets, is now being turned into Lincolnshire Poacher Cheese. To help with this growth, Simon’s brother, Tim joined the business on the sales & marketing side in 2000.